My first experience with Vegemite was when a friend offered me a spoonful. Vegemite does not taste anything like chocolate. Chocolate tastes, well, heavenly, and melts in your mouth, and makes you feel like you are floating on clouds. It elevates your psyche and instills lightness where darkness once existed, benevolence where once there was stress and anxiety. Chocolate could be the answer for world peace. Vegemite is disgusting, foul, and doesn’t belong on any food shelf anywhere. Yet the Brits and the Australians think it’s fantastic. Clearly, there is a cultural component to our tastes in food. I wonder how much is nature vs. nurture. Why do American kids “have” to dip vegetables in ranch dressing (I’m holding out on this one – really hoping my son will eventually eat vegetables rather than scraping his tongue with his hand à la Tom Hanks any time I feed him veggies) yet no other culture seems to have this “need”? Why do we like the things we like? Americans, in general, adore peanut butter. Yet ask your average French person how they feel about peanut butter and they will make the same face I made when I ingested Vegemite. Root beer – we Americans love a good root beer float, right? Yet the French find it disgusting – most will say it tastes like cough medicine. Then there’s pastis. A French liquor, popular in the south of France as an aperitif, especially at the end of a hot summer day. It’s flavored with anise and tastes like black licorice to me – another thing many Americans don’t tolerate well. I sat at a restaurant table full of French people one summer evening, riddled with incredulous arguments as to the merits of pastis after I took a sip from my husband’s glass and declared as politely as I could that I’d prefer to order a cool glass of rosé, thank you very much. That was not my biggest faux pas. 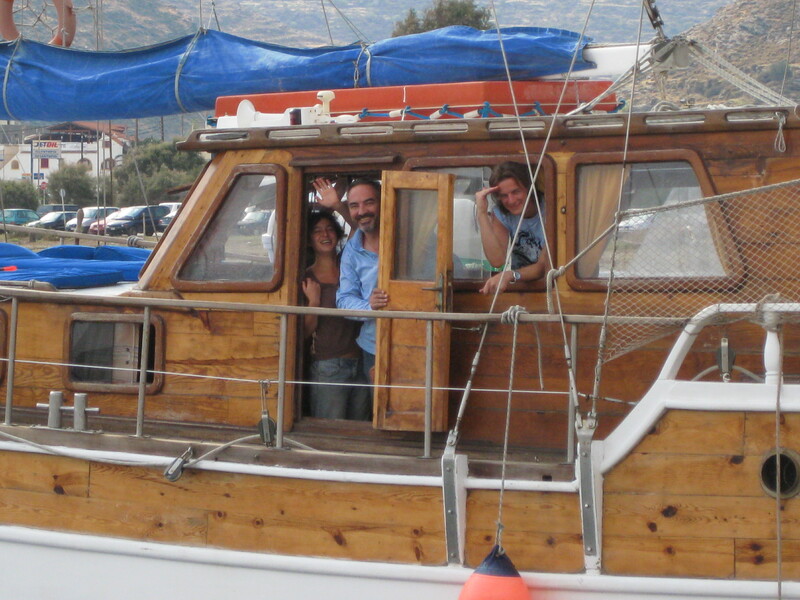 We took a sailboat cruise in Greece one year, led by a ½ French, ½ Greek captain. He had an intense gaze, a fiery temper, and a fabulous sense of humor. I took notes on the trip determined to write him into one of my novels as the larger than life character he was. I was both fascinated by him and a little bit scared of him. 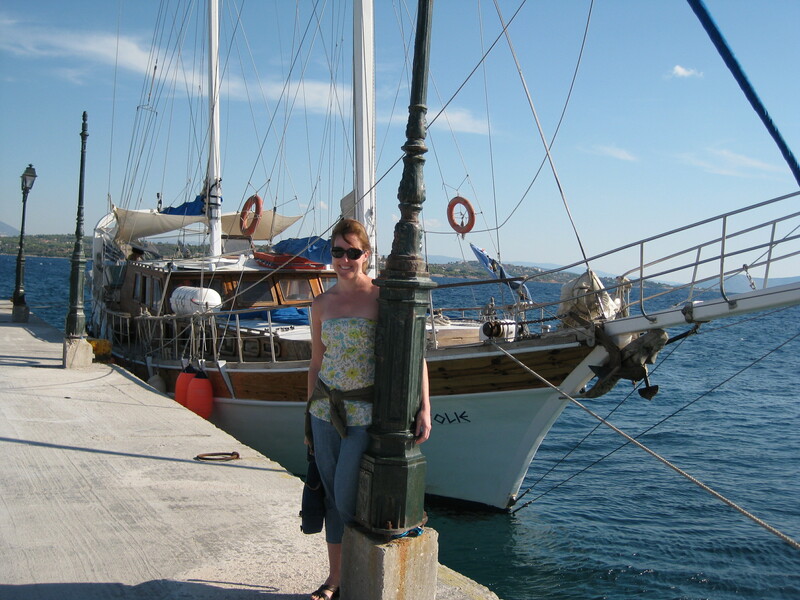 One night, while we were docked in a charming small Greek coastal village with absolutely no nightlife, he popped open a bottle of Ouzo, Greece’s anise flavored liquor, and offered it to us. Not wanting to offend, I downed my glass full as quickly as possible. He offered another round. I drank. And again. Yet again, seriously straining my constitution. Then, thank God, the bottle was emptied, but wait, no! Let’s open another! There were seven of us on deck that night, I the lone female. My stomach started to get queasy, my head woozy, and I tried to refuse the next round, but my refusal was refused. I looked to my husband for help, but he was in ouzo bliss and reeled in by male bonding. All in the name of politesse, I took my glass, closed my eyes, and downed it as quickly as I could, my seventh or eight or fifteenth glass, I’d lost count. Another round came. I had plans for this one. When everyone tossed theirs back, I tossed mine, too. Right off the boat and into the water. “What was what?” I tried to play innocent, but I’m a terrible liar. One of the other guys looked from me to my glass and back. An incredulous reaming, half-serious, half-joking, ensued, and it was determined that I must go on trial. The captain grabbed the broken table leg and it became his gavel, my husband pleaded my case, and I was sentenced to singing. In front of everyone. So, drunk and determined to give the offended captain a good show, I grabbed the gavel, turned it into my microphone, and gave the most rousing rendition of “What Do You Do With a Drunken Sailor” that boat had ever been privy to. I definitely can’t stomach anything with anise now. What other flavors have you found that are popular in one country but wouldn’t fly at all in your own? I didn’t even touch on “delicacies,” like snails, frog legs, bone marrow in France, guinea pigs in Peru, or No-Idea-What-Part-of-the-Cow that was in China (all of which I’ve eaten). I’d love to hear your stories! This entry was posted in Culture, Food and tagged anise, culture, French Food, ouzo, pastis, peanut butter, root beer, taste, vegemite by A French American Life. Bookmark the permalink. It is interesting how certain foods are pleasurable and others aren’t. I also have a French husband who loves Pastis. It is definitely not my drink. Yet I like fennel on fish and many years ago I have a fabulous fish dish in Greece that was seasoned with ouzo. I love cinnamon yet my mother only likes it in small amounts. My children loved watermelon sorbet and candy and I think it is terrible. Cinnamon – another thing I’ve found that many French friends don’t care much for! Funny, if there anise, fennel, and sometimes even too much basil (all related) in a dish, I can’t really stomach it. Otherwise I’m far from a picky eater. Wrung-out sweaty gym sock. Yum. I haven’t heard of Noni juice, but now I’ll know to avoid it! I could probably write an essay of my own on this… You’re absolutely right about the French not being fond of peanut butter (my mom hated it for the longest time and still hardly ever eats any). It’s starting to catch on somewhat: I’ve seen small jars of it in the imported food sections at various stores. It hasn’t caught on like Oreos, though. As for typically cultural things, while I love most Italian food, to this day I am annoyed by their habit of putting orange blossom extract in ALL their pastries, even the more typically French ones, like croissants. That is akin to blasphemy, as far as I’m concerned. I’ve also discovered that putting mustard in sandwiches seems to be an American thing: every pre-made sandwich I’ve come across here either has butter or mayonnaise in it. The only place I can get a sandwich with mustard is Subway. Another food-related pet peeve is the French habit of putting emmental on pizza instead of mozzarella (though that is finally starting to change). On the flip side, I’m both amused and annoyed at the US not allowing cheeses made with raw milk. I feel compelled to remind them that pasteurization has only been around for a little over a hundred years, and people have been making cheese for a lot longer than that. Serving cheese as a separate course before dessert is also very typically French, and we have fun introducing our American friends to this little tradition. Also, while I’ve cut down on soda drinking in general, I’ve found I generally prefer those sold here than in the States (less weird artificial stuff, unless it’s diet, which I don’t drink anyway). On the flip side, I miss sweet tea. And I get raised eyebrows on either side of the pond when I mention that I don’t like Nutella. That’s more a question of personal taste, though. Orange blossom in croissants – I’m with you, absolute blasphemy. Your comment about raw milk reminds me of all the things we are cautioned to avoid when pregnant, and how vastly different the “foods you must avoid” are from country to country! I explained to many gaping, shocked friends that I was sure French and Italian women continued to eat “soft” cheese, and that the small bit of caffeine in my decaf coffee was not going to ruin my unborn child! It is amazing how different cultures don’t like each other’s tastes or foods…. am with you on the pastis don’t really like it either…. however peanut butter and jelly yum… my dad ( who is french) is currently visiting, when I made him a sandwich with ham, butter and cheese he was horrified – How dare I put cheese with ham & butter…It is either cheese or ham not both and it is a silly Australian thing to do according to him. As for vegemite it is an acquired taste it took my husband about 10 years to learn to like it, babies learn to love it when they are young and don’t really have a choice… see my post on it a few months ago. You need to be an expert to eat Vegemite by the spoon. For beginners I would suggest vegemite and butter at a ratio of 1:2 on the freshest bread you can find. Or on toast. Or cruskits, salada, grill toasted bread rolls, wheat bix, etc. If you don’t like that, try it with cheese as well. Or honey. Vegemite is like wine. Once you’ve acquired the taste, it’s one of your favorite things in the world. Vegemite and peanut butter is another combination that I enjoy. But ever Australians think it’s weird. When I get the ‘yuk face’ response to anchovies, I always ask, “Have you ever actually tried them?” Put some in a plain red sauce and it is transformed! Never attempt a foodgasm without provolone or anchovies . . . or both! But to be fair, Ima not gonna try no Vegemite! Hmmm – I suppose I could try them in a red sauce. Still, I have my doubts! Good call – stay away from Vegemite. He was being mean. He knew it was nothing like chocolate, but he knew if he said it was chocolate I’d try it. I’m still traumatized. 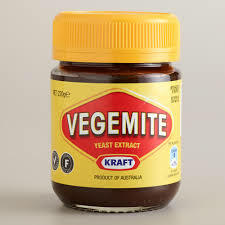 I don’t understand the Vegemite craze either. It’s definitely an acquired taste. People here give it to their kids from a very young age so they’re used to it. I’ve been living in Australia for 9 years and I just can’t do it. I tried, and it’s plain disgusting. My husband’s an Aussie but luckily for me he isn’t a big fan of Vegemite either so our kids won’t eat it either. I agree with the peanut butter. I can eat it but I’m not a big fan (only in very small doses), yet my husband can’t live without it! One thing that I can’t do is a greasy breakfast (like the traditional bacon and eggs). I’ll have that for lunch without any problems, but not breakfast. Also, Australians will never EVER eat rabbit. I think they see them more as pests than food.